Most marketers in the room knew exactly when GDPR will take effect, but was not exactly sure what will it mean for the industry. GDPR concerns the entire industry, not only companies selling product and services to the European Union (“…if you have a form on your website, somebody from EU can fill it out…”). Though most marketers in the audience were marketing to EU and, sometimes, were operating under stricter guidelines in US also. What to do with the data entered by sales? All data has the same requirements. What to do with database contacts, which do not have explicit permission? You can ask for the permission now. How to handle the requirement to keep data on European soil in the age of Cloud? Can you rely on IP for “Country” form filed? No. Are the same rules coming to US? The public is concerned about the recent Facebook issue… Would California be the first state to entertain stricter rules? Europe is traditionally more concerned about privacy, and US is more lenient. Most likely US won’t follow GDPR quickly, if ever. “Now you can not receive a concent in exchange for an eBook..” European community now is inundated with opt-in emails… What to do? We need to have compelling, interesting materials… and possibly combined concent seeking online effort with a phone-based approach. Hushly is able to “reclaim” a portion of site visitors who typically abandon the site with an innovative approach. Leads generated are “human-verified” and GDPR/CASL compliant. 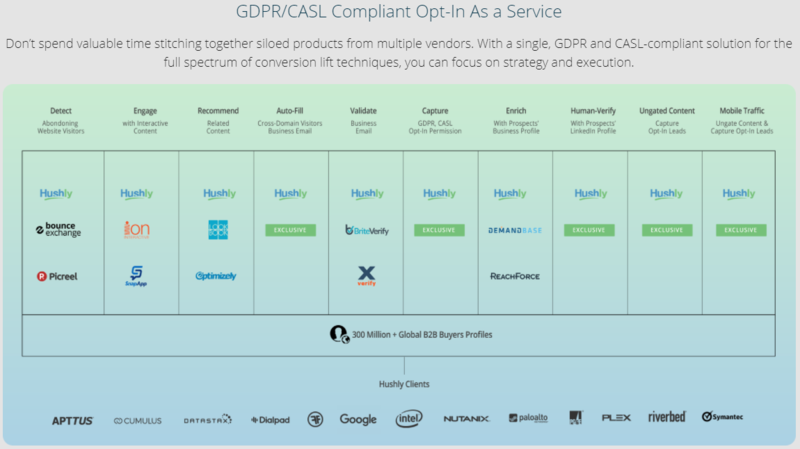 Hushly website has an interesting comparison of different vendors from the compliance perspective. Activate specializes in demand generation. Activate site features a useful infographic indicating that opportunities and SQLs seem to be the measure of marketing success (replacing MQLs), what was already common in the industry. 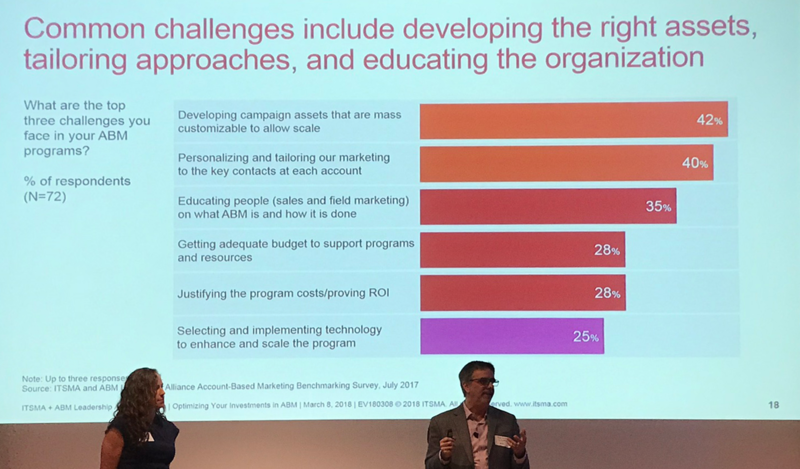 At the beginning of the event, a roomful of marketers was asked if they were doing or thinking about ABM – most hands went up. The next question tried to identify who “figured ABM out;” at that moment most marketers in the audience were turning around trying to find raised hands (so we could find these gurus at the bar later and investigate the secret). 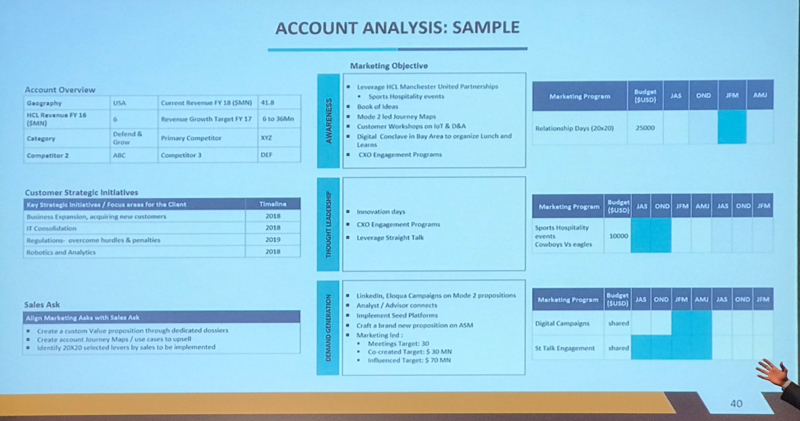 Nobody claimed to figure out Account Based Marketing. Everybody wanted to get an advice. Presentations started. Interesting: several vendors in the field formed an “alliance” to promote the concept, and this event was part of their effort. Also interesting: the alliance members are technology companies, but a very traditional live event introduced the organization to many local marketers. ABM is clearly working for many organizations (based on ITSMA research). Though there are challenges (click to enlarge an image below). 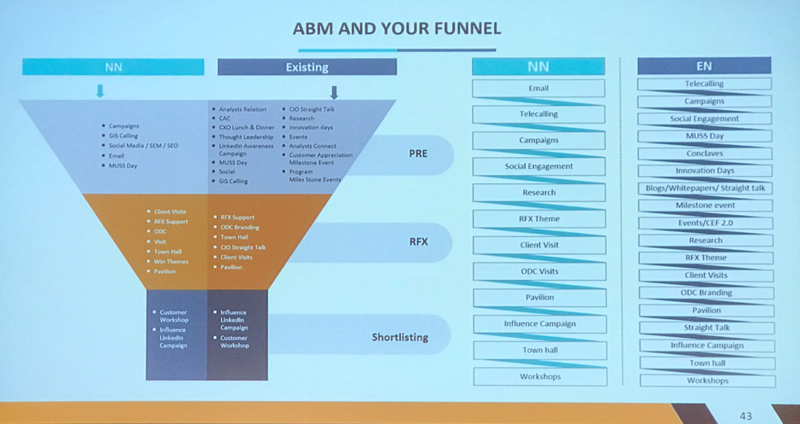 Usual three types of ABM were discussed. Marketing and sales alliance is critical for AMB, and it is generally understood in the industry. Marketing and Sales, however, may understand ABM differently. Sales: marketing will dedicate a marketer to my account – excellent! Many companies apply “top ABM” to large existing accounts. The dynamic of ABM expansion is different in large enterprises and smaller companies. Enterprise typically starts from “one-to-one” and progresses to “one-to-many,” while smaller organizations are moving in the opposite direction. Many organizations discover new competition: “We were here… and now Amazone is a competitor – no matter in which market you are…” This environment encourages the move to ABM. Off-line personal activities are as important: road shows, direct mail, etc. Campaigns leveraging 4 channels are about 3 times more effective than campaigns concentrated on one channel. One of the “stack samples” with reasonable, and clearly defined categories. Interesting: “one-to-many” approach is considered a “traditional marketing” by some organizations, what makes sense. Other companies maintain “one-to-many” or “traditional marketing” approach in addition to ABM for all accounts. It might be done because of branding benefit or for practical reasons, as excluding key accounts from every campaign might be difficult on the organizational level (particularly in the enterprise setting). Important to select “one-to-one” accounts carefully;” it is difficult to allocate resources to “one-to-many” approach. May not be possible to apply ABM approach properly. MQL is dead… Set meetings in qualified accounts are one of the metrics; general account engagement is another metric. HOWEVER, ABM approach functions alongside traditional demand gen, as more leads are needed. What do you wish you knew before starting your ABM journey? We should not look at leads but concentrate on account engagement. We spent too much time on content journeys, while we needed to concentrate on volume. Do we have people to target? We needed to find data: if data is not good, relationship with sales would suffer. We are a video company… and direct mail is one of our most effective channels. All campaigns should be planned across multiple channels. Rep said: “Marketing does not do anything for me!” The rep was involved only after any solid lead was generated. However, the account had many interactions; this information was not initially exposed to sales. Start by building relationships with interested reps. They will help to involve the rest of the sales organization. One person from marketing is now sitting in sales meetings. Sales are comfortable giving feedback to this person. Community managers are great resources for ABM. Was investment in other areas reduced because of the start of an ABM effort? We are just investing more overall. Currently, ABM efforts are 25% of spend; plan to expand to 60% – 70%. We added ABM and not cut anything; ABM and “traditional” demand generation are working in parallel. NetLine – a Content Syndication Network. Could potentially allow testing content free of charge – need to investigate. Sigstr – allows creating promotional elements for employee signatures. The promotions are editable from the central location and include reporting. 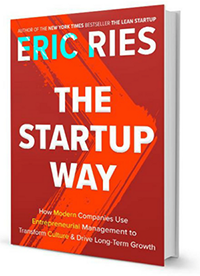 I enjoyed the previous Eric Ries book, Lean Startup (listened to it at least twice), though I waited a couple of years to start. The book was recommended a few times based on my reading interests, but I did not think it was relevant to me. At that time I typically worked for large sleepy companies. I thought my “skunk works” navigation of political and operational networks within a large organization was dramatically different from a startup approach. “Startup” concept felt frightening. When I finally picked up the book, it felt very relevant and had a following within slowly moving enterprises on high levels. Though… nothing seemed to happen. 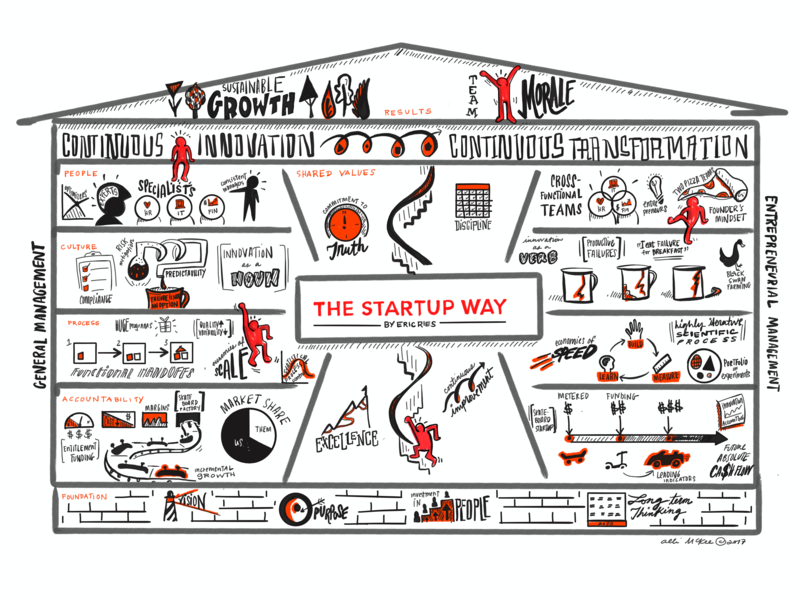 The Startup Way is the inspiration (and an instruction) to everybody on the inside of an average enterprise. This volume explains how to take the ideas of Lean Startup and make them work within a large company. The approach makes sense even it the company has been organized in the most inhospitable way for anybody with a slightest entrepreneurial thought. But – times are changing, and changing fast. Companies need to innovate their way to a continuous existence and find a reliable methodology to do it consistently. The Startup Way has many interesting examples showing how internal teams avoided similar misunderstanding. One of the critical approaches is metered funding. The idea should not receive an additional funding unless it has not proven itself in customer tests. A concise summary of the book is available at Your Exec. This resource also has interesting examples of PPT templates.